On the 11th of November Flykten till Framtiden (English: “My Future Love“) hits cinemas in Sweden. The feature-length film is directed by Ulf Malmros and Jaana Fomin and stars Henrik Dorsin, Elias Palin, Victoria Dyrstad and Johan Ulveson. The time-travel themed narrative is partially set in 1973 and for this composer Jimmy Lagnefors was hired to create a soundtrack authentic to the period. 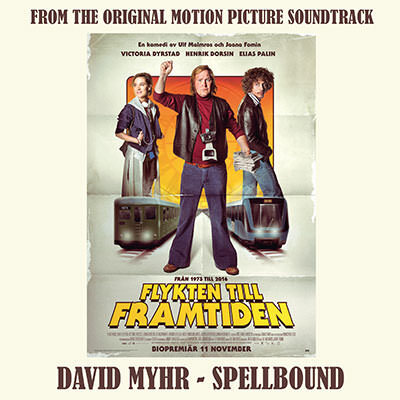 When the directors specifically requested a song that “sounds like Electric Light Orchestra” Lagnefors brought in songwriter/artist David Myhr to collaborate. Myhr, with his background in the 90’s power pop combo The Merrymakers and, in particular, his 2012 album Soundshine, has demonstrated a knack for creating fresh, modern, pop music with roots firmly in the classic tradition of McCartney & Lynne. It was no surprise that Myhr jumped at the chance! Lagnefors and Myhr were also behind the song Vänta inte på mig (“Don’t wait for me”) in last year’s Swedish box office smash “Micke & Veronica”. With the new song “Spellbound” the songwriting duo have created “the song that E.L.O. never made”. It features heavily in the film and plays when the credits roll. David Myhr’s single “Spellbound” is out now!